Silence the enemy with the latest in gaming weaponry. Introducing the first comprehensive Cyber Snipa CS-SILENCER Laser Gaming Mouse that boasts a full arsenal of features. Adapt on-the-fly or be eliminated. 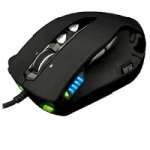 The Cyber Snipa CS-SILENCER Laser Gaming Mouse has advanced macro technology for professional gamers. The intuitive software allows you to record macros, which can then be assigned to any of the 9 customizable gamer buttons of a profile. With 7 gaming profiles available, you can fully customize the mouse to include over 63 commands. Featuring a fully adjustable 100-5000 DPI, gaming grade laser engine and LED indicator, the Cyber Snipa CS-SILENCER Laser Gaming Mouse delivers unprecedented levels of performance. With on the fly DPI switching between the 4 completely customizable resolution levels, you can easily adjust the mouse to suit your gaming needs. Order it today!